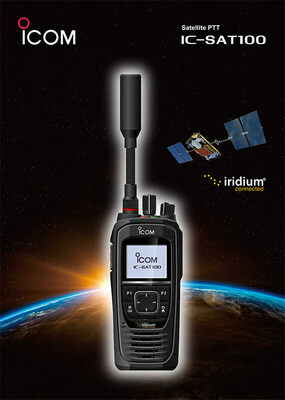 Communicate Globally in Real Time at the Push of a Button with Iridium and Icom Inc.
MCLEAN, Va., Nov. 9, 2018 /PRNewswire/ -- Iridium Communications Inc. (NASDAQ:IRDM) announced today that Icom Incorporated (Icom) has joined its partner ecosystem as a licensed Value-Added Manufacturer (VAM) and will be developing the world's first truly global push-to-talk-only (PTT) radio handheld. Based in Japan, Icom is a world-class manufacturer of two-way handheld radios and will harness their extensive expertise in the making of their first Iridium® handheld. This new device will be ideally suited for remote workers, first responders, global military, NGOs and other organizations in need of real-time communications throughout areas lacking ground infrastructure. Iridium PTT technology allows teams to remain closely coordinated with their headquarters or other field teams around the world, instantly, regardless of geography. The development of this new PTT handheld comes in response to increased market demand for products that are focused on providing a rugged and high-performing solution that supports Iridium's PTT capability. Icom was chosen in large part due to their recognized expertise in the land-mobile radio (LMR) industry where they provide dozens of products through a growing portfolio. This is the first satellite-based handheld developed by Icom, and it is designed to integrate seamlessly with Icom's current selection of accessories. This will allow for the new satellite handheld to be quickly inventoried and integrated with their existing deployed products. "When searching for the right partner to develop our first PTT-only handheld, we had a number of required criteria. First and foremost is a track record of world-class product success that will support the proven reliability and robustness that Iridium subscribers have come to expect," said Joel Thompson, vice president, global product and service management, Iridium. "Icom is a premier brand with recognized expertise. They fit the exact mold of everything we could want to develop a world-class product for our customers." Both Icom's and Iridium's distribution networks will offer the new handheld, expanding Icom's presence to the satellite industry and bringing Iridium's satellite PTT capabilities to Icom's existing global sales network. The new handheld is expected to be available in 2019. Icom President Masataka Harima says, "Icom has been developing various wireless communications equipment for land use, marine use and air band use. This satellite PTT project will be a tough challenge, but the project will fill an important piece of our product lineups that cover all areas from the surface of the earth and even into space. We continue to challenge ourselves." Iridium is the only communications company that has truly global coverage and is currently in the homestretch of a $3 billion initiative to upgrade its entire low-earth-orbiting satellite constellation with a new generation of interconnected satellites, known as Iridium NEXT. To date, 65 new satellites have been placed in orbit, with the final launch of 10 satellites planned for December 30, 2018. Upon completion, a total of 75 Iridium NEXT satellites will have been delivered to space, with 66 in the active constellation and nine serving as on-orbit spares. Statements in this press release that are not purely historical facts may constitute forward-looking statements as defined in the Private Securities Litigation Reform Act of 1995. The Company has based these statements on its current expectations and the information currently available to us. Forward-looking statements in this press release include statements regarding the deployment of the Iridium NEXT constellation, and the capabilities and benefits of new services to be enabled by the Iridium NEXT constellation, including Iridium PTT. Forward-looking statements can be identified by the words "anticipates," "may," "can," "believes," "expects," "projects," "intends," "likely," "will," "to be" and other expressions that are predictions or indicate future events, trends or prospects. These forward-looking statements involve known and unknown risks, uncertainties and other factors that may cause the actual results, performance or achievements of Iridium to differ materially from any future results, performance or achievements expressed or implied by such forward-looking statements. These risks and uncertainties include, but are not limited to, uncertainties regarding potential delays in the Iridium NEXT deployment, the development and functionality of Iridium NEXT and related services, and the company's ability to maintain the health, capacity and content of its satellite constellation, as well as general industry and economic conditions, and competitive, legal, governmental and technological factors. Other factors that could cause actual results to differ materially from those indicated by the forward-looking statements include those factors listed under the caption "Risk Factors" in the Company's Form 10-K for the year ended December 31, 2017, filed with the Securities and Exchange Commission (the "SEC") on February 22, 2018, and in the Company's Form 10-Q for the quarter ended September 30, 2018, filed with the SEC on October 25, 2018, as well as other filings Iridium makes with the SEC from time to time. There is no assurance that Iridium's expectations will be realized. If one or more of these risks or uncertainties materialize, or if Iridium's underlying assumptions prove incorrect, actual results may vary materially from those expected, estimated or projected. Iridium's forward-looking statements speak only as of the date of this press release, and Iridium undertakes no obligation to update forward-looking statements.